This is a new week. Last week was a tough one. Ever have one of those weeks that you look forward to, have fun during said week, and then, are so exhausted by the end you think to yourself “What was I thinking?” Last week was that week for me. Last week I had 18 bosses and we ran out of soup. I know that doesn’t make any sense so let me explain. Sunday was Easter (duh), which means that last week was Holy Week (another DUH). A glorious week of reflection and worship for Christians as we celebrate the resurrection of Christ after his crucifixion. 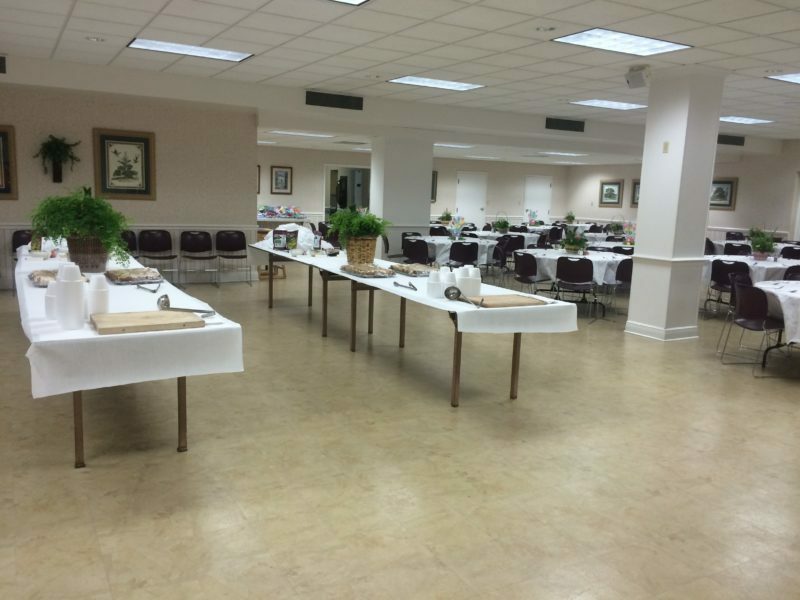 Our church celebrates by having daily worship services followed by a luncheon. ALL FIVE DAYS! Different local pastors from different denominations come so that our services are varied. 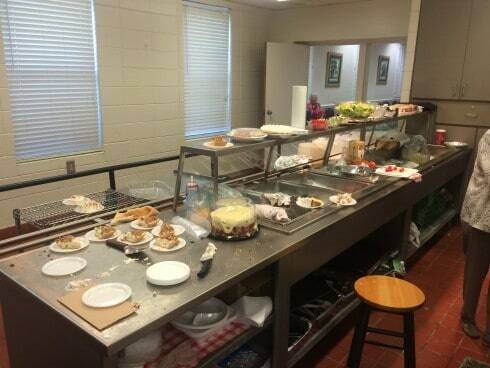 Lunch consisting of soup, salad, sandwiches, and corn muffins is offered every day by our Kitchen Committee. For the Kitchen Committee, it’s their Superbowl event. For the last 5 years I have been cooking all the Wednesday night (Family Night) meals, and for various other dining opportunities at our church, so naturally, the Kitchen Committee (KC) asked if I could help out with various needs that might arise during this week, and do all the dishes. Since I am in this particular kitchen more than they are, I help them make tea, find various utensils, and lift heavy pots of soup. I don’t mind doing this because I love being in the kitchen! My fondest memories all involve being in the kitchen. Just like that old fishing adage that states “A bad day fishing is better than a good day at work,” I love to spend even bad days in the kitchen. Holy Week had 4 good days, but one day we ran out of soup. That was a game-changer! 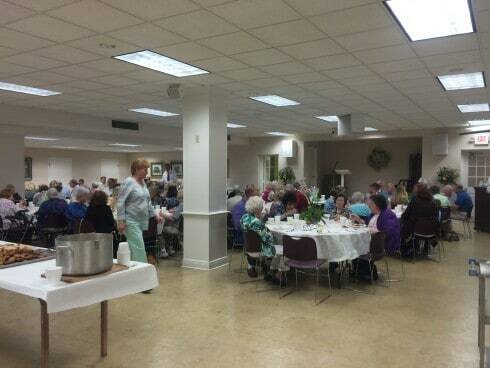 See, the KC has been putting on the luncheon for Holy Week for 345 years. Not really that long, but it seems like it. They have a notebook full of menus, which is really just 1034 copies of the same menu, that they have been serving each and every year. Time-tested, Southern favorites, that keep them coming back year after year. Sandwiches with delicious fillings like chicken salad, pimento cheese, pineapple and cream cheese, ham salad, and egg salad. A garden salad and thin, crispy corn muffins to accompany them. But the star of the show is the soup. Vegetable soup made with ham, chicken and rice, potato, and broccoli soup, all made with homemade stock and each ingredient cut into a dice that will remind you of culinary school practice. You may think that seems like a daunting task, but don’t forget there are 18 people all crammed into the kitchen cooking. Many hands make light work, but also make for a territorial nightmare. Everyone has their own way of doing things, and the way the like to keep their kitchen. Just imagine 18 different areas, each run their own specific way, down to their own spoons and dish towels. A hard minefield to navigate, especially when they are all screaming your name for help. So many personalities also makes it hard for everyone to get along. Sunday afternoon prep is fun and feels like a homecoming. Everyone sharing stories around the 45 pounds of onions and 6 hams that we have to dice to exactly 1/4 inch dice and then divide up into ziploc bags for each day’s soup and sandwiches. The one OCD person who follows you around and sterilizes anything and everything you touch. The person who decides to make a new recipe for apple salad, asks everyone their opinion for 4 hours straight, agonizes over adding an 1/8 teaspoon of honey, then just ends up making the exact recipe they started with in 1695. This year’s winner was the 93-year-old who told me she went on a cruise (since we were talking about someone else going on one) and saw a naked man walking through the spa. It was the best cruise of her life she said. 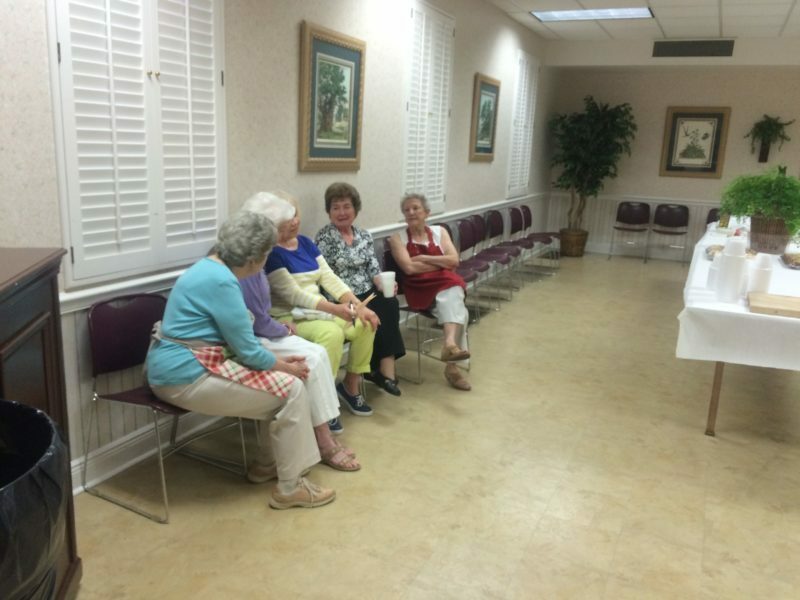 A few members of the KC catching a break before service. Don’t get me wrong, I enjoy working with them! I have learned so many tips and tricks that have helped me with my own cooking. Things you can’t read in a book because they are passed down from generation to generation. I learned how to keep my corn muffins from sticking to the pan, and how to coax great flavor out of bones for stock. These lessons I will never forget. I just wish they were as willing to learn from me as well. I won’t make the old dog and the tricks comment. Times have changed. We are no longer in the Great Depression as many of them lived through it or just after it, and my time is spent differently than theirs. 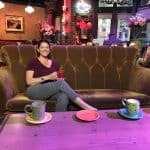 My husband travels most days of the week, I have two young boys at home, I cook part-time, and I try to blog as much as I possibly can so I can make it full time. I don’t have time to go to every grocery store in a 50-mile radius to save $0.01 per head of iceberg lettuce or buy onions 5 months ahead of time because they are on sale. In this “future time,” they have these things called pre-chopped frozen vegetables. The KC refuses to buy them because they cost 3 cents more (I’m exaggerating slightly of course). Don’t get me wrong, I am cheap when it comes to some things, but spending 18 hours chopping onions and celery for 10 pots of soup would work out to be over $160 paying minimum wage. I know that they are all grandmothers and are retired, the average age is over 80, and they have nothing else to do, plus doing everything from scratch is the “right” way, but when they all start complaining about how much work it is, how their arthritis is acting up, and how tired they are after 45 minutes of cooking, my sympathy level takes a nosedive. They judge me for taking “shortcuts” with my food, but then wonder how I “do it all” and can still find time to hit the gym. I wouldn’t say I “do it all” because my house is a mess and no one in my house has clean shorts but I prioritize! My chicken and rice soup tastes just as good as theirs and takes a fraction of the time because I use store-bought stock. Everyone scarfing down the lunch! Since I cook for the same church on Wednesday nights and serve an average of 80 people, I have learned to scale my quantities to feed the masses. Their inability to deviate from the “Holy Week Bible of Menus” led to The Great Food Shortage of 2015. The same recipe that they created in 1574 and fed the 56 people who came to Holy Week will not feed the 134 that showed up in 2015. How did that happen? Of course, it is not that there are more people, the ONLY explanation is that the servers are giving too much food. I know how much my grandmother ate, which was enough for an appetizer for me, but when a 34-year-old man who is 6’3″ and at least 195 lbs walks through the line, HE’S HUNGRY! And God forbid he take more than one 1/4 inch corn muffin or 2 sandwich halves because there are two different fillings available. PEOPLE LIKE TO EAT! THE FOOD IS GOOD! Get a grip ladies and buy more food next time:) Better yet, let me order all the items for you, from our food supply company, and have it delivered straight to our refrigerators! No need to burn 156 hours driving around town and using 5 tanks of gas. Much less lifting all those items (unloading the car after the daily shopping trips was my job as well), hoarding all those plastic shopping bags, and organizing all those receipts. Desserts being sliced and salad being portioned. One thing that no one complains about during this week are the desserts. Church members sign up to bring their homemade creations all five days and we get a delicious variety! The KC also gets first pick and had to do some Quality Control testing daily. Since I gave up chocolate for Lent, I was limited on my dessert options, but I am happy to announce that I sampled a light and citrusy Key Lime Cake, about 3 different coconut cakes, key lime pie, and I ate the equivalent of 2 whole caramel coconut pies that one of the ladies makes every year. She has graciously agreed to share that recipe with me so I can put in on the blog. That way you too can eat two pies worth. Overall I would say that about 1/3 of the desserts brought in/donated were eaten by the KC and never made it to the dessert table. After the 5 days, we still had lots of desserts left over. Somehow they made it into the cars of various other people on Friday. My hubby and I did fight over a particular coconut cake that was anonymously dropped off. I think I have figured out the recipe and hope to be showcasing it here soon as well. Let me just say that it was also a game-changer. Overall, Holy Week went well. They ladies did take my advice on the following days and make a little bit more soup than normal. It did take a few hours of discussing all the changes in amounts and making more homemade broth. Too bad someone dropped the 120-year-old Tupperware on the floor and the broth was lost. Don’t tell anyone they used the boxed broth I still had in the church pantry. They would never be allowed to show their face in Sunday School again. Laughed so hard as I read this because it is so true!! Like you, I love this week, and I have learned a ton from these wonderful ladies. Watch out when we take over…1 hour of work and 3 hours of play will be the KC during Holy Week when that happens!! My job description will be: open the bag and dump the salad in the big bowl. PLUS I can promise you we will have brown eggs, not white!! Absolutely!!! Susan’s caramel pies are going to be on the blog soon! Thanks! I’ll be posting that recipe very soon! I spent my time with that wonderful committee and she really isn’t exaggerating too very much. So much more I wanted to say but I know that some church members read my blog and even more are Facebook friends of mine:) Thank you for your continued support!! !